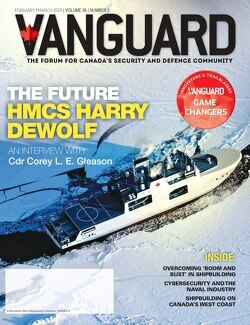 When a new government is elected on October 19th, 2015, a number of key priorities outlined in the 2008 Canada First Defence Strategy (CFDS) will remain unfulfilled, including demonstrating domestic readiness—particularly in the Arctic—enhancing Canada-US relations through defence and security initiatives and realizing/rebuilding essential capabilities through major capital acquisition. Uncertainty abounds as election 42 unfolds, both for Canadian Parliament and many industry sectors impacted by government decision making, and polls throughout summer 2015 first predicted a minority government that could go to any of the three main parties. Even as the polls shift to a leading party, what is certain, is that Canada’s next Prime Minister will face a number of outstanding commitments—some too far advanced to reconsider—that will demand leadership and close attention in order to ensure completion and delivery. Upgrading the Canadian Army’s land combat vehicles and systems, which originally involved the acquisition of new fleets for close combat, protected personnel transport, combat engineering tasks and other land-specific capabilities. These commitments included expanding the size of the armed forces—Regular and Reserve—as well as improving National Defence infrastructure across Canada. In a series of pre-election announcements, Prime Minister Harper’s cabinet announced infrastructure investments to improve Armouries and Drill Halls for a number of Reserve regiments, while also committing during the federal election to expanding the size of the Reserve force including re-establishing a Yellowknife-based unit. These announcements are merely initial promises, and will demand a Conservative government to fulfil; but, if the promises of 2006 remain unfulfilled, it may be entirely appropriate for industry to question how defence procurement will go forward in the 42nd Parliament, regardless of which party is in power. Though the outcome remains uncertain, early polls indicate the distinct possibility of minority government. Although a minority government has the same role as in a majority, it needs support from the opposition to move forward its legislative agenda, and may spell some changes to how industry interfaces with federal decision makers or procurement stakeholders. The biggest consideration for how industry engages a minority government – regardless of the party in power – is that minority governments face more instability than majority governments. Once Parliament resumes, money cannot be spent by the federal government without Parliamentary approval, which can be challenging to move forward with in a minority government, especially for defence procurement. Minority leaders are more likely to avoid controversial proposals and decisions, as they are forced to compromise with their opposition. Deal making, therefore, will be required. Industry may want to increasingly work with both governing and opposition parties in order to help broker or lead new initiatives. For the defence industry, new initiatives may range from introducing options for new capabilities acquired for federal purposes, or in how the government procures and measures industrial participation. A minority parliament also means that engaging government decision makers will be increasingly challenging. Members of Parliament (MPs) and Ministers invited to tour industry bases and facilities may be more likely to decline the offer, as the presence of members in the House will be mandatory. When inviting Ministers or MPs to travel for example, industry can expect that invitations will be extended to opposition members in order to maintain the balance of power in the House. When engaging with a minority government, industry should appreciate that the opposition can be empowered. Industry will want to work with and cooperate alongside government proposals and initiatives, however industry stakeholders may want to consider enhancing relationships with the opposition. Opposition members can be a productive ally if industry wants to work towards new proposals, impact a government program, add to the federal budget, or influence existing legislation that impacts their businesses practices. A minority government provides the unique opportunity for existing legislation to be amended. Standing committees under a minority government, like in the House, will have more opposition members than government members. Industry will do well to engage both governing and opposition members, particularly as an opposition member will chair most committees, set the agenda, choose witnesses, pass motions and introduce subject matters for study. Engaging the opposition can additionally influence the bureaucracy in a minority government, as ministerial briefing books will more often include opposition’s position on various issues. As a result, opposition members will have increased opportunity to access Ministers and their offices. With an unstable Parliament, industry seeking to introduce proposals that diverge from existing policy platforms may face additional resistance if the proposal in question is outside of the policy space of the opposition. Additionally, programs that in the past have been marred with controversy, could see additional delays as the leader prolongs decision making, neither deciding in favour or against existing proposals – even Diefenbaker waited until his majority Parliament to cancel the Avro Arrow, while Chretien leveraged a majority in order to keep his promise of cancelling the EH-101 contract. It’s relevant to note that three defence policy white papers have been released during previous minority governments, including CFDS, and there is no direct correlation between type of government and defence spending. Under Pearson, Trudeau, and Clark’s minority governments, defence spending as a portion of GDP fell slightly, while spending rose slightly under the Martin and Harper’s minority governments. So, although some adjustments are required by industry on how to approach government, the type of government, historically, has not had significant impacts on defence policy; rather, external events including international threats and the economy typically shape federal defence policy and capital acquisition. Some major procurements first identified in CFDS are moving forward and will continue to post-election, while others are likely to see continued delays. For the RCN, the CSC procurement process is currently underway, with bidders responding to the Crown on Warship Design and Combat System Integration packages. No party has expressed opposition to the procurement, so as the other NSPS programs, this should continue to move along at whatever pace the Crown sets. Though not identified in CFDS, the stopgap for JSS – the refurbishing of a supply ship for the RCN – has also not received opposition from any party. The RCN is in such dire need of a solution here, and contracts have been signed, making it unlikely that direction will change from a new government – minority or otherwise. The RCAF may receive different attention from a new government. All parties are in favour of a new fleet of FWSAR aircraft, so industry can expect this procurement to go forward after the close of the competitive bid process. However, the Liberals and the NDP have expressed significant opposition about the CF-18 replacement program, particularly the process in which a replacement is selected. Precedent suggests that, should there be a minority government, the Prime Minister may be challenged to call for a cancellation or change to the structure of the program. Yet, it shouldn’t come as a surprise that the Liberals or the NDP may move towards an open competition, in spite of their strength in the House. It may all depend on which party holds the balance of power. What’s for sure is that external events like the increased threat from Russia may necessitate the need for enhanced capabilities to defend North American aerospace, be it a CF-18 replacement, the North Warning System replacement, or even a new capabilities like a HALE asset; but, the declining price of oil may restrict a new government’s spending power. Major capital procurement for the Canadian Army will received mixed reception from a new House. Completed bids, such as MSVS, ISSP and the Coyote upgrade, are unlikely to be cancelled, but could see delays as a new government avoids running a deficit or prioritizes the acquisition of other platforms for the RCN and RCAF. Though there are no open objectives from any party to recapitalizing Army equipment, the Canadian Army may be seen as a lower priority for upcoming procurement projects. Additionally, a new government could re-define the role of the Canadian Armed Forces, which would shift capability requirements. Industry investing in recapitalizing the Army should be patient and strategic, as is highly likely that program delays could occur, especially if a new government is adamant about avoiding a deficit. On October 19, when the results are revealed, industry would be smart to proceed cautiously. New Ministers and MPs will likely have a significant learning curve when engaging with their new portfolios. Strategically engaging the right decision makers on both sides of the House, within the civil service, and even within program review bodies, will be essential to access and influence decision making that impacts Canadian industry and enables them to deliver the right equipment for the Canadian Forces with the best value for Canadian industry. Meghan Spilka O’Keefe is a Senior Consultant in Procurement at Hill+Knowlton Strategies, a full-service government relations, communications and procurement firm. Meghan is the recipient of PR in Canada’s Top 30 under 30, and has a strong background in defence procurement and public affairs.